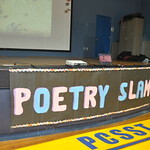 The fourth-sixth graders have been working on a poetry unit over the past couple of weeks and had the opportunity to showcase their poems in class as well as in the annual PCSST Poetry Slam. This year's Poetry Slam theme was "Embracing Your Culture" in an effort to promote cultural awareness and coordinate with the Multicultural Night festivities that took place on the same day. The students' cultural pride shined through in their poems and everyone was able to learn a little more about where we originate from and what makes us unique!